International Finance Olympiad is an initiative to make young learners familiar with the need and art of managing money. It is expected that gradually the adolescents shall inculcate the habit of analysing finance in their day to day life, shall strive for savings and shall also invest their available resources to multiply their worth so that they have comfortable resources for their future endeavours. Schools have an important role in introducing newer concepts & making students part of such campaign. 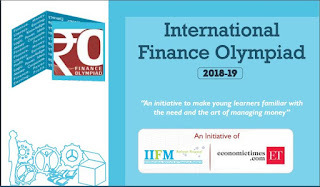 Therefore, schools across India & Middle East can associate with International Finance Olympiad. *Date is opted by schools authorities for this round from the given period. - Top scorers of each class from all the Regional Rounds will be awarded the cash scholarship of 10,000 each. Top most teams will be competing in an on-stage oral quiz to win a coveted cash scholarship of 1.6 lacs. Winning teams from different regions will be representing their school and regions at an international level in the Grand Finale. Winners will be felicitated with Awards, Trophy, Memento and Gift prizes.